The 90 nanometer (90 nm) is a process for manufacturing CMOS integrated circuits. The first successfull manufacturing using this process was reached in the 2004–2005. Although the process may be a few years old, about 80% of all manufacturers still use it today for highly complex circuits. This is because the process has been well established, and high reliability is archieved for the integrated circuits manufactured using this process. Usually the Elbrus 2000 series of microprocessors are manufactured by TSMC in Taiwan using the 90 nm process. In 2012 Russian companies have acquired the technology and design rules to manufacture these kind of integrated circtuits domestically. Russian government is funding $16.0b in into the Electronic Industry and Angstrem signed an agreement with IBM for 90nm technology transfer. The WTO accession will have a positive impact on easing up high-tech trade. SEMI advocates for fast and simple implementation of the new rules. 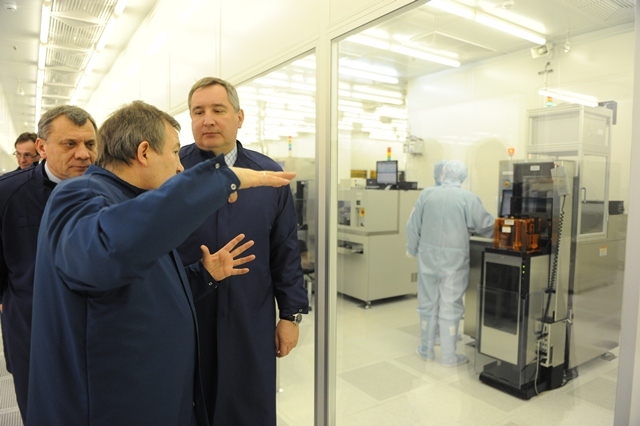 25.09.2012 | Microelectronics – commenced sales of products with 90nm topology Moscow, 25th of September 2012 – Sitronics Microelectronics, largest producer and exporter of microelectronics in Russia and CIS has started supplies of chips developed and produced by 90nm technology. In October 2012, IBM and the Scientific and Production Association (SPA) Angstrem signed two agreementsto spur technology innovation. In the first agreement, IBM has licensed Angstrem integrated circuit technology for 90nm production for use at the newly built fab in Zelenograd. In addition to the 90nm technology license, Angstrem will receive design rules from IBM required for contract manufact uring organizations so that the company will be able to offer "Smart Foundry" services to Russian and foreign customers. The second agreement outlines areas of potential mutual cooperation in the field of research and development activities with the use of advanced microelectronic technology.